This is my first Tulip photo of the year and won’t be my last. I know many have been done, but still doesn’t take away the beauty. 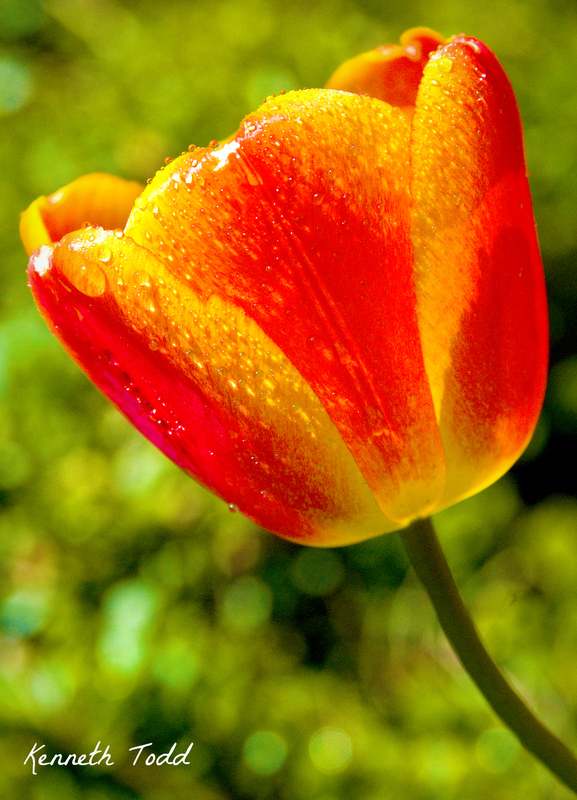 I took my spray bottle with me for this one, and gave the Tulip a little drink and also enhanced my photo. I want to share this quote that my sister shared on her Facebook page. It is awesome. So awesome isn’t it? I hope you all have a wonderful weekend and enjoy creating memories. Really beautiful photo, the up-close shot with these magnificent colors just make this extraordinary! Keep up the great work, from one photographer to another! So vividly colorful!! I love this! Tks. Nature in all her beauty. Lovely photo. The water technique is pretty cool. Thanks for sharing. Wow…I wish I had a huge copy of that on my wall! Just gorgeous. You can have a digital copy if you want. Now THAT’S a tulip! Spectacular! I love tulips and they always brighten my day. So go ahead and post and many as you like. It’s beautiful. Beautiful tulip, and beautiful capture. Think I’ll try that water spray approach – it looks amazing! Absolutely beautiful. My favorite flower, too. You captured it’s beauty and the colors are stunning!